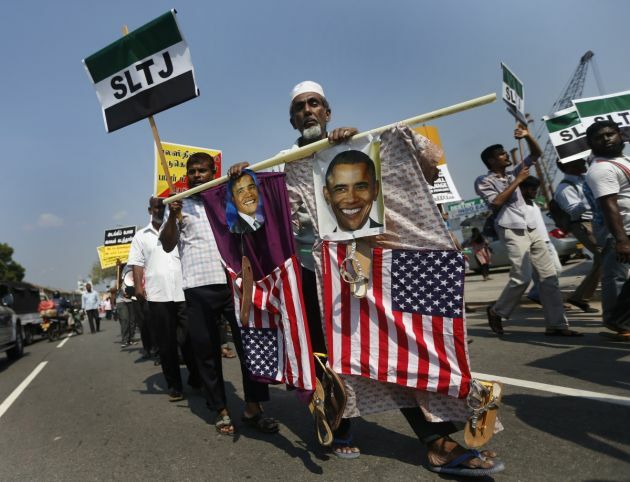 (Photo: REUTERS / Dinuka Liyanawatte)A man, carrying depictions of U.S. President Barack Obama, protests against the UN and U.S resolution against Sri Lankan war crimes, during a demonstration march towards the U.S embassy in Colombo March 26, 2014. Sri Lanka questioned the independence of the human rights office of the United Nations on March 5, a day after the United States asked the U.N. to investigate human rights violations by the Sri Lankan government.The U.S. resolution calls for the U.N.'s Human Rights Council to investigate "past abuses and to examine more recent attacks on journalists, human rights defenders, and religious minorities." A lawyers group in Sri Lanka has expressed concern over an ongoing government campaign to curb the flow of information, particularly in incidents involving sectarian violence. Authorities said they would take legal action against social media users critical of the government, the Bar Association of Sri Lanka (BASL) said, lamenting the tight controls on traditional media and independent news websites. "Right now the only way to get information is social media as most of the independent news websites have been blocked by the government and pressure has been imposed on traditional print and electronic media," said Lal Wijenayake, a committee head at BASL, ucannews.com reported. He noted instance, social media proved to be an authoritative information source during anti-Muslim violence in two coastal towns in Sri Lanka that left three persons dead and at least 150 injured in June. Sri Lanka has a Buddhist majority of nearly 70 percent of its 21 million people. Muslims account for nearly 8 percent, Hindus 7 percent and Christians for just over 6 percent. Users turned to social media to exchange information and photos after most news outlets had been barred by authorities from entering the towns of Aluthgama and Beruwala. Over the weekend, Defense Secretary Gotabaya Rajapaksa issued a stern warning against people continuing to use social media after the violence. The defense official, a brother of Sri Lanka president Mahinda Rajapaksa, said the government would take action against people who would promote "racial or religious hatred via social media." Gotabaya Rajapaksa also called for legislators to craft laws to deal with aspect of social media, local media reports said. Wijenayake noted that the government must clarify in detail what it construes as "hate speech" as the term could be vaguely interpreted as any message critical of the government made through social media. He said the government has had a history of "manipulating data" to serve its ends. "The government all this time has covered up all negative information about it, but now they are being exposed," he said. He was referring to recent reports about the government bloating its statistics to paint a picture of a rosy economy to attract investors. For his part, bar president Upul Jayasuriya warned about the impact of government censorship on social media. "The entire media is already blocked by way of threatening journalists and media institutions, or by buying them off," Jayasuirya said. Though the government maintains people's right to free speech, information minister Charitha Herath also underscored the need for "established criteria" on social media to stop troublemakers from using it to sow misinformation.